The iRoar Go might have a long history of predecessors, it's quite a new category on its own. With slightly improved performance over the Roar 2 it's leaning towards the capabilities of its bigger brother, the original iRoar bluetooth speaker. While the iRoar thrives in pure audio performance, it lacks in portability; the iRoar Go balances on both fundamental standards. To give it an extra vital feature of this age, they made the new bluetooth speaker splash-proof. 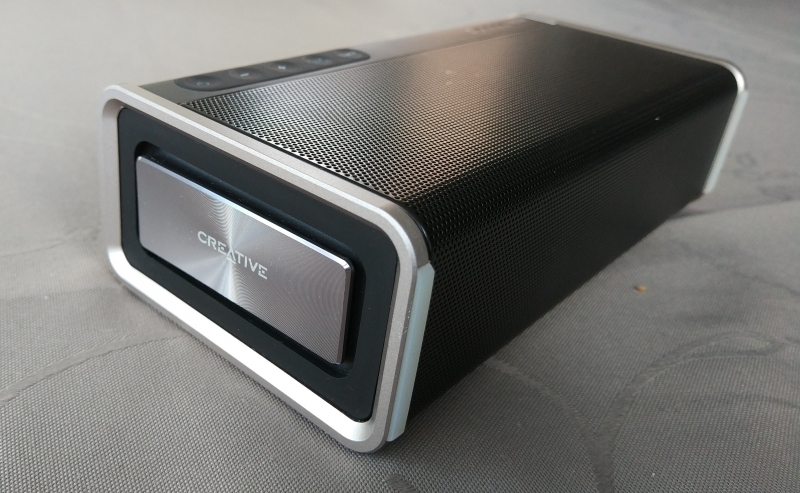 From the beginning, I've been a huge fan of Creative's line of premium bluetooth speakers. The first Roar got me astounded with its incredibly clear and loud sound. Of course there were other brands releasing similar products around that time, but Creative certainly had my attention with that one. In the meantime I've been reviewing comparable products and more and more products start to earn their place in this category, that makes it more and more interesting to what time will bring and how portable audio solutions will evolve with it. Let's have a look at Creative's iRoar Go. Over the years, several Roar speakers have been released for the crowd. Here at BHTec, we've seen all of them except the TopDog original iRoar which was released previous year. The story of Creative's Roar line began with the first SoundBlaster Roar which is currently sold for just £99.99. Not long ago we reviewed the Roar 2 as well, bringing more balanced sound in a smaller, more stylish form factor. The new passive radiators left a good impression, this feature seems to reappear in the iRoar Go. While the SB Roar 2 is sold at the same price point as the first Roar, today's prior asset, the iRoar Go is sold on a price point of £159.99. First of all, what is exactly the difference in size and weight between the three? Following pictures might give an idea how the speakers differ in form factor. Being more powerful than the two other Roar speakers, the iRoar Go sets a record in both portability as performance/mm³. We saw some refinements with the SB Roar 2 resulting in a more sleek and modern design. Just like the Roar 2, the iRoar Go offers two very neatly finished passive radiators which are a charm to see in action. Amp-design hasn't changed, still using a bi-amplified (two amplifier) design which dedicates an individual amp for both the high and low frequencies. Most other speakers use a single amp design causing audio distortion when both lows and highs are played on higher volumes. One of the flaws I saw in the SB Roar 2, the unshielded passive radiator which would poison the sound when anything touched it while playing, is partly reduced due to the extended ends on the edges. However, most of the time this shouldn't be a problem at all. But when carrying it around in a regular backpack when you're on the go (or for example when you're skiing, like I did, Yeah I'm a young fellow myself :) ), you might notice it slightly when something hits those radiators. It could be solved be including some shielding accessoiry or shifting shield for when the consumer wants to use it this way. This would allow the speaker to keep its awesome looks in open display. Additionally to this, Creative does have some kind of solution for carrying the speaker around, a lether-made shoulderbag might just fit your needs if it's not for intensive action. The internal design of the original Roar used to have two front facing 1.5" Mylar high frequency drivers, a 2.5" upward facing Bass-Midrange driver and two passive radiators on the sides. To save space and keep the same roomfilling audio output, Creative chose to face both front facing high frequency drivers upwards. A well balanced shape of the iRoar Go makes is very suited to play on higher volumes without shaking. Other features are kept the same; microSD slot and USB, built-in MP3 player, Roar button for volume boost, TeraBass for slightly more bass, 6000mAh Battery that can be used as power bank, built-in micro for calls (and recordings) and all connectivity features like Bluetooth 3.0, Aux-in and NFC (and also the microSD and USB can be used to play music). Creative informed us that some functions have been left behind to reduce production cost including the alarm function which was basically useless.. The buttons for Roar and TeraBass are now used as one. You got the choice between a Roar optimized standard setting (which includes the previous Roar and TeraBass function), the flat setting or you can enable equalizer allowing the user to control the setting through a smart device. Being a Personal Public Address (PA) System, it can be used in classes or even as just a voice amplifier for songs and alike. A microphone adapter is included. We shot our packaging pictures in quite a dark room and because the packaging is still on the other location I couldn't redo the shots of the packaging in a brighter environment, our apologies. Similar design choices were made for the Roar 2, giving it a sleeker look than the orginal. It's hard to say which one I like most, both are a pleasure for the eyes. While the iRoar Go and Roar 2 retain the sturdy-feeling design from the original Roar, it has been given a more attractive and laid out exterior. The extending edges of the iRoar Go give it a more secure form factor against all kinds of stuff, this makes the iRoar Go less fragile compared to the Roar 2. Both might be a little more fragile than the original due to the half-exposed radiators (which are awesome to see in action, so I'm not opposing this idea). With a weight of 810g, the iRoar Go is about 190g lighter than the Roar 2, making it less vulnurable to drops. Rubber closures protect the connectors against splashes. Creative is clear about the speaker being splash-proof and shouldn't be dropped in deep water. Creative's Roar products are accentuated by their most significant feature, the 'Roar' boosting feature. Accompanied by the equalized and flat feature, they tend to reach out a wider public with different tastes of music. The equalizer can be accessed through an app on smart devices or your personal computer. The Roar button "intelligently makes up for the perceived loss of bass during low volume playback without artificially over-accentuating bass levels" and is meant to boost loudness providing a more spacious and warm sound. A new feature, not seen in the previous Roar products is the Super Wide Audio technology, making the speaker seem to deliver more power than its personal size. More about this feature can be found in this article. While the iRoar sounds impressive on a low-volume using the Roar option, it only gets better when turning the volume up a notch. For some people, the amplified treble might disturb the audio experience in some audio files, but we loved the subtility of it above all. When turning up the volume you'll hear no distortion and the bass isn't notably limited by digital signal processing. This bluetooth speaker is suitable for outdoors (especially because of the new splash-proof design) and larger rooms. It's wonderful how the small speaker can keep up with the KEF muo and JBL Xtreme while selling on a much lower price point. The iRoar is probably almost as powerful and therefor has a place in between the previous Roar models and the JBL Xtreme. For the Battery, it offers 12-hour battery life which is 4 hours more than the original model, bringing it on a similar level as the KEF Muo and slightly lower than the JBL Xtreme, given the speaker's size, that's quite impressive. One thing I was not too happy about with previous speakers was the fact that the maximum volume reduced when the battery level decreases, this setting is solved with the iRoar Go. However, there's no indication how full the battery is on the speaker itself... A voice will let you know when the speaker is on its limits. The battery size is smaller than the Roar 2, but seems to work more efficient as the iRoar Go could play three hours longer on a moderate sound setting (practically tested). Using the speaker on full capacity, it's able to deliver 4-5 hours of impressive sound, on a moderate setting it's about 10 - 11 hours. Which is pretty decent for a speaker this powerful in a small form factor. In addition to this, you can also use the speaker as a power bank to charge your mobile devices. Impressed like never before, it's easy to say that Creative outpaced our expectations once again. Creative convinced us a long time ago of their excellence in audio solutions. The audio quality is slightly improved compared to the Roar 2 while the bi-amplified design is being stuffed inside a smaller device with a similarly attractive design. The structure is improved with the protective extending edges as well as the splash-proof feature, making the iRoar Go the perfect balance between powerful audio performance and portability. Accompagnied by an army of features, a decent battery, awesome-looking half-exposed radiators and a powerful and accurate audio output; there's not one bluetooth speaker that can say the same in this price category. This speaker is a real piece of technology shaping its own league in the audio market, that's why we believe this product might be the best we've seen from Creative so far. (!) Creative as a company is managed by engineers and that's what we can see in how much value is presented to the customer. We decided to give the Creative iRoar Go a Platinum award!